We live in a world where mobile and cellular phones are becoming universal, and internet connectivity is rising fast. A half-century ago, Marshall McLuhan wrote about the previous century of electronic interconnection (telegraph, radio, telephone, television) and what was to come. He argued: "The new electronic interdependence recreates the world in the image of a global village." 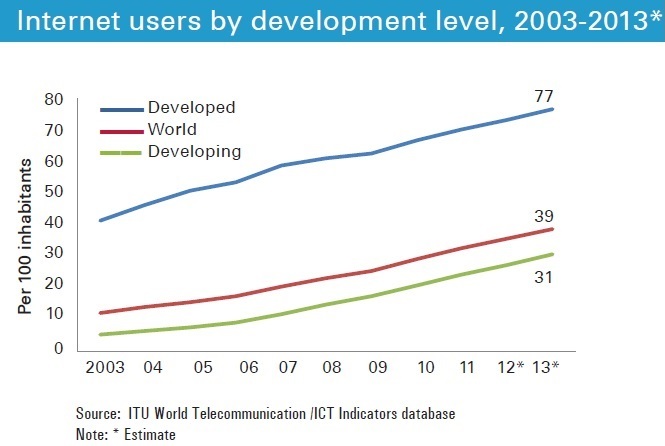 The 2013 ICT Facts and Figures (that is, Information and Communications Technology) from the International Telecommunication Union gives a sense of how we are heading for that global village. 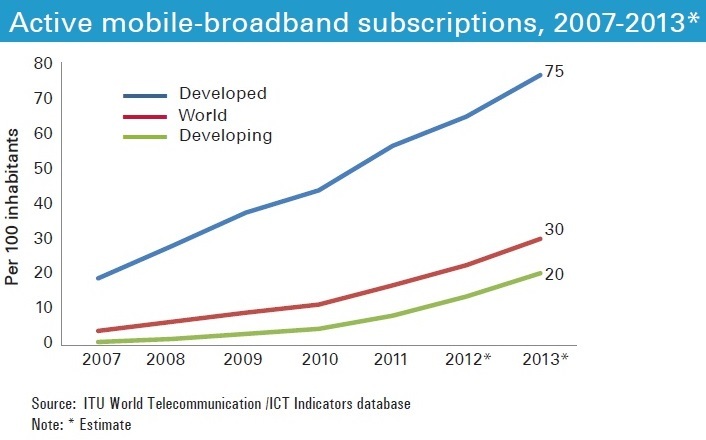 The number of subscriptions to mobile and cellular services is approaching the world population. Of course, there is variation around the world, and this is a case where 100% is not the upper limit. After all, many people will have multiple phone lines for work and home purposes. 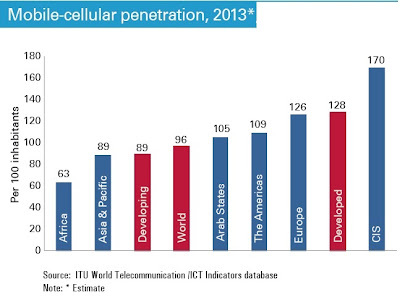 As the report notes: "Mobile-cellular penetration rates stand at 96% globally; 128% in developed countries; and 89%in developing countries." 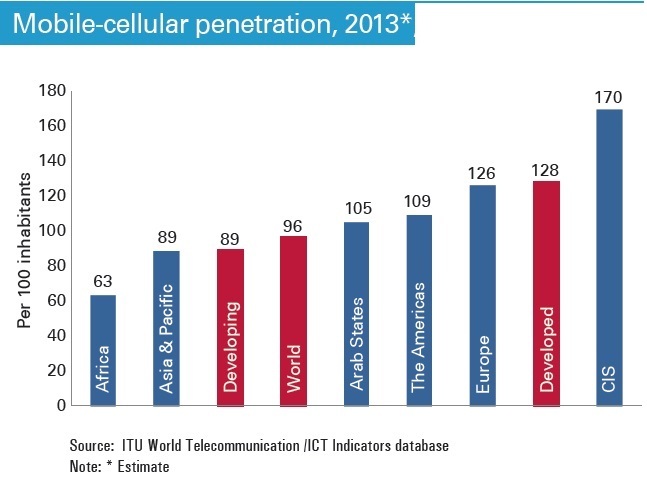 The relatively low level of mobile-cellular penetration in Africa is not a surprise, but I don't know why there is such a high level of penetration in the CIS or Commonwealth of Independent States countries--that is, many of the countries that used to make up the Soviet Union. 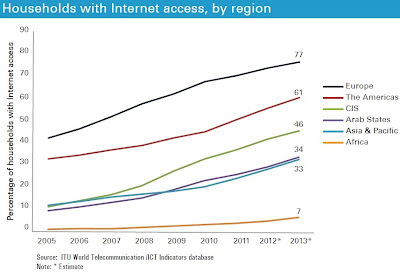 What about use of the internet? 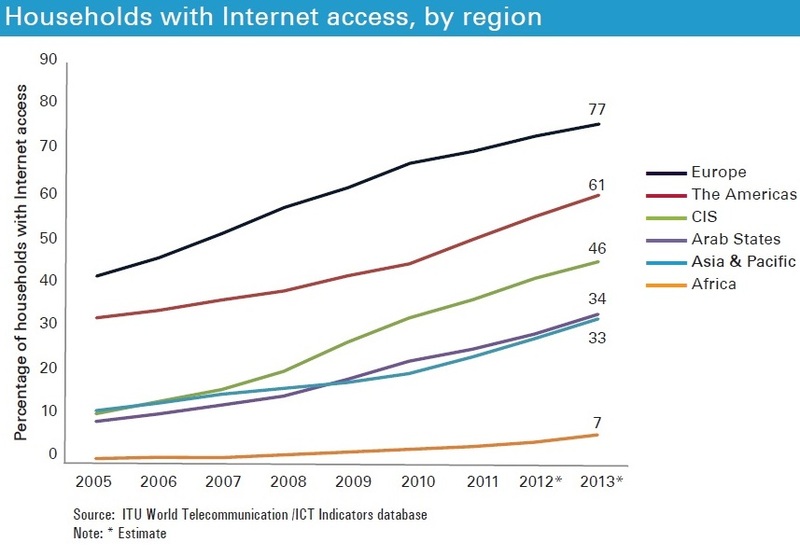 The proportion of those using the internet is rising fast everywhere, but is more than twice as high in developed economies. Here are overall statistics, and a breakdown by region. 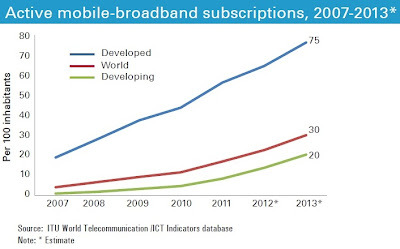 The next wave, of course, is the combination of these two--that is, the share of population with mobile broadband access, effectively turning your phone into a useful internet connection. Those who want more details, information about price trends, and the like, can start by consulting the ITU report on "Measuring the Information Society 2012." In my own life, my sense is that at least so far the internet is often a way of accomplishing the same pre-internet tasks faster: that is, it's faster and easier to find an article, send a manuscript, check a quotation, fine a movie time, pay a bill, get directions, buy a book, drop a note to a friend, and so on. 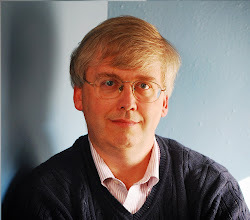 But I suspect that in the global village, my personal life and my environment are going to be shaped more and more by abilities, activities, and interconnections that would have been inconceivable before the global village. Of course, this blog is one such activity.